The transition from high school to college is usually the most dramatic in young people's lives. In this humorous and thought-provoking resource, Chuck Bomar offers up pearls of wisdom gained over years of personal and professional experience. It's great as a graduation gift, as a college freshman small group discussion starter, or as any number of other uses. However you put it to work, you'll be sure to save some young adults some pain, money, and from foot fungus. Table of Contents Introduction Life Direction Thoughts on Intimacy Unknown Common Denominators Roommate Etiquette Money Wisdom Education Wisdom Random Daily Life “Wisdom” Identity Faith Wisdom on Campus Ministries Connecting with New People Dating Wisdom After serving for almost 9 years as pastor of student ministries at Cornerstone in Simi Valley, California, Chuck is now lead pastor of Colossae Church, in Portland Oregon. He's founder of CollegeLeader.org and has helped over 45 churches start and develop a college-age ministry. 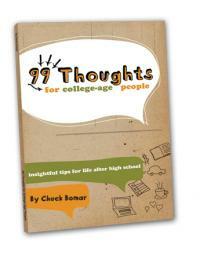 Chuck has written numerous articles and is author of Foundations of College Ministry and 99 Thoughts for College-age People.